Montefiore Medical Center's Division of Clinical Pathology is responsible for the laboratory testing of blood, urine, and body fluids for disease diagnosis and health maintenance. The Division is comprised of 10 Laboratory Units, each headed by a specialist who provides for skilled management, provision of he newest and most accurate tests, and expert clinical consultation. Utilizing the latest advances in computer technology, the Division maintains millions of dollars of state-of-the-art automated equipment at its laboratory sites at the Moses, Einstein and Wakefield campuses and services hospitals, nursing homes, the Montefiore Medical Group, faculty practices, and voluntary physicians' offices at more than 40 sites. The majority of these sites are linked to the core laboratory through the Montefiore Clinical Information System. A wide array of point of care equipment is also available to bring specimen testing directly to the bedside, the operating rooms, and the intensive care units. Clinical Chemistry: Clinical Chemistry provides biochemical analysis of blood and urine for the determination of electrolyte status, diabetic control, markers of tissue damage, and a host of other substances in serum and plasma that indicate a patient's degree of health or disease. Hematology: The Hematology laboratories analyze blood for the diagnosis of anemias, leukemias, bleeding disorders, and thrombotic tendencies. Microbiology: Clinical Microbiology services for the diagnosis of bacterial, mycobacterial, fungal, and parasitic diseases are centered at the Moses site. Blood Bank, Transfusion, Apheresis and Cellular Therapy: The laboratories oversee the accuracy and safety of blood transfusions and provide advanced therapeutic apheresis services to critically ill patients. Virolology Laboratory: The laboratory provides comprehensive testing for viral disease including tissue culture, serology and viral load assays. Cytogenetics: Cytogenetics testing is performed with the most advanced molecular probes for the diagnosis of hereditary diseases as well as subtle presentations of leukemias and other malignant conditions. 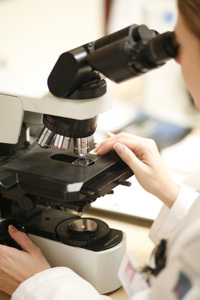 Molecular Pathology: The Molecular Pathology Laboratory at Montefiore Medical Center offers a broad menu of molecular/genetic testing in the areas of hematopathology/oncology, microorganism detection, genetics, pharmacogenetics, and engraftment monitoring. Flow Cytometry: Flow Cytometry provides testing to classify leukemias and lymphomas, to enumerate hematopoietic stem cells for bone marrow transplantation, and to quantify CD4 helper T-cell for assessing immune status. Weiler Rapid Response Laboratory: The laboratory provides a full range of tests to support the acute care needs of the Weiler Division.